TV with Thinus: BREAKING. Brutal assessement of TopTV and its pay-TV failings by StarTimes which is looking to bail out the South Africa pay-TV service. BREAKING. Brutal assessement of TopTV and its pay-TV failings by StarTimes which is looking to bail out the South Africa pay-TV service. China's StarTimes media group which is looking to potentially bail out the beleaguered TopTV in South Africa gives a brutal assessment of the myriad mistakes TopTV made both as "inexperienced" management and in its floundering pay-TV product. In the new Business Rescue Plan released by TopTV's business rescue practitioner of the "failed" TopTV service, StarTimes weighs in on the myriad mistakes of On Digital Media (ODM), its management and it's pay-TV product which StarTimes wants to overhaul completely. The struggling On Digital Media (ODM) entered business rescue at the end of October 2012 after it was declared technically insolvent by June 2012. The Business Rescue Plan names StarTimes' interest in acquiring a stake in TopTV as the company's only and last chance to stave off liquidation. South African broading regulations currently cap foreign ownership on licensed broadcasting entities at 20%. StarTimes has harsh words for the TopTV management, saying the TopTV management "implemented an unrealistic operation strategy and business development plan" and that while the "overall management incurred high remuneration, purchasing and operation cost", the pay-TV service suffered due to a lack of "previous experience in, and a deep understanding of, the pay-TV industry and a general lack of business management experience". StarTimes says it has identified "operational deficiencies" in TopTV which includes "low quality programming, high costs, inappropriate packaging and a high churn rate". It also says TopTV has a small subscriber base which impacts content cost, purchase cost, subscriber development cost and market competitiveness. StarTimes says "the lack of scale and experience of management resulted in low quality and highly priced programmes" at TopTV. StarTimes says TopTV "failed to observe that television is an entertaining terminal enjoyed by the whole family" in terms of how it designed packages, and that this led to TopTV "active user rate being extremely low". Star Times says TopTV's "subscriber base stagnated". "The subscriber either has to buy all the packages (in which case TopTV does not have any advantage over DStv in terms of price), or buys the basic package which offers limited programming. Because the other packages cannot be sold alone, TopTV subscribers can either not afford the whole bouquet or they feel the programmes on the limited, low-cosst package is not an attractive option." "TopTV does not have any differentiation or competitive advantage," says StarTimes. "DStv is a very strong and powerful pay-TV operator in the South African - and even in the Pan-African - market. Compared with DStv, TopTV does not have an innovative business model or differentiated products and services and has no cost advantage due to its small size in the market." 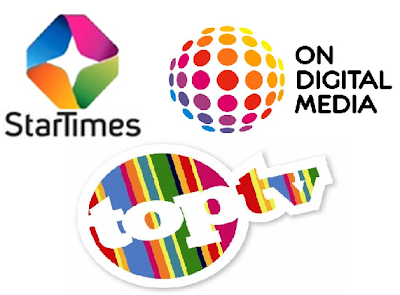 StarTimes says one of the operational weaknesses at TopTV "has been the high cost paid by the company for programme content" and that StarTimes has already started discussions with content providers at negotiating new contractual terms for the supply of programming. StarTimes says that TopTV's "goodwill" in the market place has been eroded, but that StarTimes its "highly respected and influence and reputation" can help to restore TopTV credibility and restore its operations.